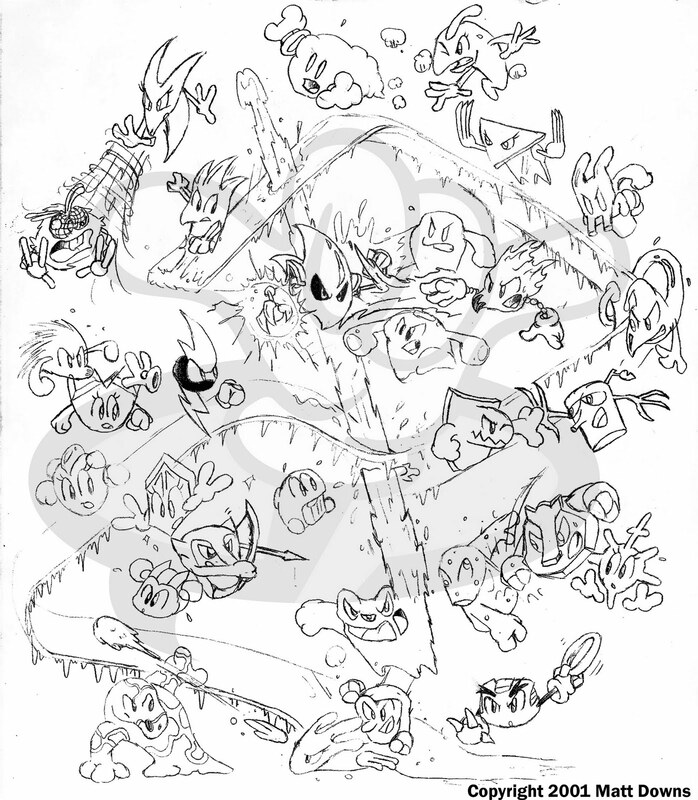 Lost Art: Clash of the Elements – Matt Downs Draws! It took 9 years but I finally found it: One of my best cartoon drawings as a teenager. I’m guessing I drew this in (probably) 2001. I had a huge idea to draw Globber-Man and the other Element Agents fight against the equally powerful Man Made Agents in a all out battle royal that would fill up an entire page of violent chaos! I have begun to hate myself for my drawing skills in the past. This was all done in pencil, but was all drawn on the first try. Now days, I draft line all of my characters in action and it takes longer to finalize them. Back then I was so confident in my line work that it seemed that my pen or pencil was doing all the work! I am amazed at how much is really going on in this drawing and it was a nice little reminder of how passionate I was with this little character and that I would spend my whole afternoon to draw 20+ characters fighting and evading each others attacks. Looking at this really inspired me to re-draw it with the new drawing skills that I have learned since then. Who knows, maybe soon there will be a “10th Anniversary” rendered print of this piece.